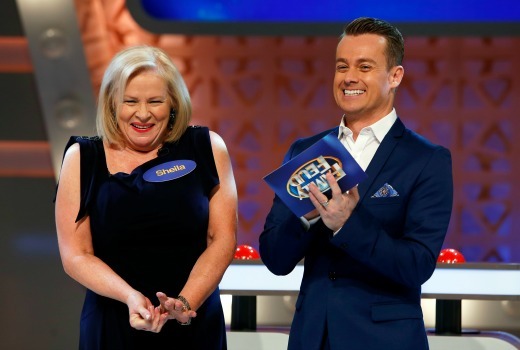 TEN star Colette Mann appears twice on Family Feud on Tuesday: once in All Star Family Feud: Prisoner v Wentworth, and also as Sheila Canning joining her on screen family in a show-within-show Neighbours storyline. “Grant Denyer was just an absolute, consummate professional,” Mann recalls of the Neighbours episode. “He had lines to say, a scene with Gary (Damien Richardson) on his own and he was just wonderful. For her Prisoner battle Mann is team captain, joined by Val Lehman, Fiona Spence and Ian Smith. The two iconic soaps are not far apart for the veteran star. Neighbours is filmed in the same Nunawading studio as Prisoner, where its exterior walls doubled as the prison building. Mann finally left Prisoner in 1983 but in the interim decades before joining Neighbours (2011), she had numerous roles with Melbourne, Queensland and Sydney Theatre Companies, The Flying Doctors, Blue Heelers, The Dish, Priscilla Queen of the Desert, Radio 3AW and MTR, plus writing two books and columns for New Idea, and numerous personality appearances on Good Morning Australia, The Circle, The Don Lane Show, Hey Hey it’s Saturday, What’s Cooking and Saturday Kitchen. In 1996 she even walked the Kokoda trail for A Current Affair with Dermott Brereton, Grant Kenny, Daryl Braithwaite, Angry Anderson and Dr. Kerryn Phelps. “It was really the first reality programme,” she recalls. “They took all these celebrities onto this trail expecting one or two of them to make it to the end. It’s 110 kilometres up and down and we had to shoot it in 9 days. On the trail she also befriended her PNG porter Donald, a friendship which has continued to this day. He was even brought to Australia by producers of This Is Your Life to surprise her on TV. “I’m still in contact with him and I look after his family in New Guinea. Daryl Braithwaite’s porter Eddie was his cousin and for a while we used to fly them down at Christmas,” she explains. Die-hard Neighbours fans will recall Mann played ‘Cheryl Stark’ replacing an ill Caroline Gillmer for 8 weeks in 1995. She was wrapping up at 3AW when she was approached by executive producer Ian Bradley and casting director Jan Russ. “When I came off air they said, ‘What are you doing on Monday?’ and I said ‘Nothing,’ because I was finishing my shift and going into unemployment,” she remembers. Fast forward to 2011 and Mann was cast in a role pitched as the “new Mrs. Mangle” (the late Vivean Gray), Sheila Canning. “(Producer) Alan Hardy said, ‘It’s really important that she has warmth and that the audience likes her and she has humour. That’s why we’ve asked you to do it.’ So I’ve always remembered those words. “I decided her overall objective is loving her family and keeping them together. So anything she does that’s a little bit in the grey area I use that as a motivation. She’s constantly interfering in Gary’s lovelife –but it’s because she wants her son to be happy. “The young writers do tend to think I was born in 1910 so I sometimes have to drag her up into the later part of last century! “Sheila’s not Susan Kennedy (Jackie Woodburne), and definitely not Helen Daniels (Anne Haddy), but she’s the mother hen of her family and even some of the others. Whether acting, writing, hosting radio, or appearing as a media personality -or even walking the Kokoda trail- Mann has managed to adapt and sustain an entertainment career for over 40 years and is seemingly happiest when she is busiest. “I enjoy acting better. What I was trained to do is act. I’m lucky enough that I can do the other stuff, or write and teach, but acting is what I prefer to do,” she reveals. “I was a great panic merchant, but the Kokoda trail teaches you to walk 20 steps and worry about the next 20 steps after that. All Star Family Feud: Prisoner v Wentworth 7:30pm Tuesday on TEN. So they win Tuesday then? I wouldn’t want to reveal a Neighbours storyline! Collette and Sheila are a great part of Neighbours, hopefully she will be in it for a long time to come. I do love the generational thing about our Aussie soaps. She was one of the young one’s in Prisoner as was Jackie Woodbourne and now they are the matriachs in Neighbours. Collette has been such a great addition to Neighbours. Sheila has become a firm favourite character for me. I especially love when Collette gets to do more comedic scenes. Really looking forward to both of the Family Feud appearances. Great interview. Thanks for featuring a Neighbours story.